I wonder how much interstate shipping would add to the cost of a load of lumber and plywood ? The blue squares have the same relative area as the openings in the Weltzheimer perf design. The ratio of areas between openings is not very uniform. The orange squares have the same total area as the blue squares, but they have a common ratio as they go from largest to smallest (in this case, 0.332). The graph shows the logarithm of each opening's area plotted largest to smallest (the Weltzheimer perf in blue, ideal geometric scaling in orange). For each set of points, a line tries to fit through the points. The lines have the same slope (by design), but note the R^2 value for the orange points is 1. This indicates that geometric scaling perfectly explains the ratio of area between openings (as expected in this ideal case). The lower R^2 for the blue points indicates that geometric scaling is a poorer description of the ratio between areas. Of course, areas don't have to scale geometrically in a design! However, a large number of analyzed perf designs exhibit strong geometric scaling. Shapes have a visual weight related to their area, position, and color. In this case, color is uniform so the center of mass is equivalent to the visual center. The calculated center of mass for the white shapes is denoted by the red dot. Inverting the image and calculating the center of mass of the resulting white shapes will give the visual center of mass of the negative space. The ratio of the distance from the design window center (green dot) to center of mass (red dot) to half the design window height gives a normalized indicate of how balanced the design is visually. Did you say that in notan, the ideal is a perfect balance of positive and negative, object and ground ? Are there other kinds of balance to be evaluated, or have you covered the field ? Notan has a concept of reversibility of a design, where the viewer can shift focus between positive and negative space. Ideally, both are interesting to see. This is definitely true for Usonian perf boards- both the openings and the "masks" are interesting. (I make no claim to be a notan expert!). Combining this idea with visual balance lead to finding the visual center for the positive and negative spaces to see if it falls on the center of the overall design window. 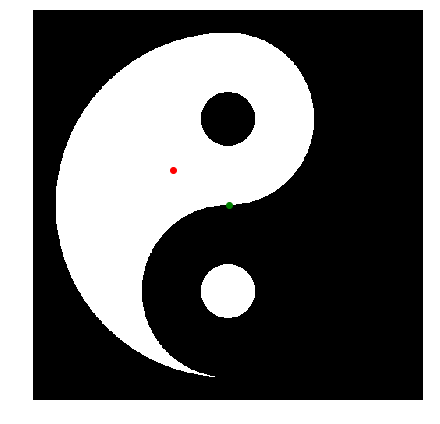 As before, the green dot is the overall center and the red dot is the center of mass (visual center) for the white shapes. One last point: since perf boards are usually placed in a series of boards, vertical and horizontal flipping of alternate boards will automatically improve the overall balance of the set of boards. Hopefully, this helped clarify my definitions of visual balance. in the way you have measured it, while being asymmetrical ? And that raises the overall question: what do you see as the value of understanding these designs through the lens of your research results ? SDR, your thoughtful questions are appreciated. They make me think deeper. So what is the value of a quantitative research approach? I think historical research gives us what happened (the artifacts) and some of why (due to gaps in the record). Quantitative research can help understand how it happened (in terms of discovering underlying systems) and maybe shed light on some of the why (for example, is a design quantifiably different from another indicating a different designer, etc.). It is another tool to chip away at understanding things deeper. As we've discussed, design grammar doesn't answer what the goal of the overall composition might be. A combination of research methods may help understand this someday. Qualitatively, we might appreciate one design more than another. Asking why this is gives a better understanding of both ourselves and the design. It also, inevitably, leads to trying to quantify something. Finally, I personally enjoy trying to use data to uncover new meanings and understanding! Yesterday, I was trolling through the YouTube offerings of Bach's keyboard music when I came across a work I haven't heard in, perhaps, ten years. (There's a lot of Bach for us to enjoy; in that way, among others, he reminds us of Wright). music on the page as it is being heard. about anticipation and reward, perhaps ? while using both hands and feet to translate those ridiculous little spots on paper into music, in "real time." only say that it brings me a full measure of joy as a lay listener. hammer, everything begins to look like a nail. composition. But as a designer I can say that there is nothing intrinsically more difficult about making an effective design that is asymmetrical. The rest of that paragraph frankly fails to make sense to me, though as before I may be missing the intent. isn't able to tell us what the designer's goal was, except perhaps by supposition. creative tools bearing little resemblance to the ones employed in their latter-day dissection . . . as I see it. Bach’s music is an intellectual puzzle. Much like Wright, there is that sublime balance between predictability and surprise. (This is what I don’t like about Mozart... too weighted in the direction of predictability). Structure is important, but extremely difficult to fathom upon first listening. It’s like watching water flowing down a stream. At first glance, it seems to repeat itself, but upon closer inspection, there is the feeling of randomness but with a structure that exists only in another dimension. It’s no surprise that Bach was a gifted improviser. Many of his pieces seem to churn along determined only by the preceding musical phrase. The structure is so well concealed that it’s nearly impossible to identify it. Much of the regularity comes from the rhythmic pulsation which is almost machine like. Aria from Orchestral Suite No. 3 in D, BWV 1068. Thanks, Peter. The Aria ("Air on the G String") is a bit of Bach that many listeners will recognize; it is to Bach as the "Hallelujah Chorus" is to Handel: a useful path into the music ? this instrument was added, doubling the harpsichord, randomly, and generally getting in the way -- but pleasantly, and audibly ! On the same You Tube site as SDR lists is my favorite Bach organ piece: Toccata & Fugue in F Major BWV 540. The toccata must tire the legs! No room for weak ankles. Years ago, I sang with the Bach Society in Mpls. We worked on two pieces for concert, Bach's B Minor Mass and Mozart's Requiem Mass. My friend (a Bach expert) said going from Bach to Mozart was like leaving a cathedral and entering a thatched cottage. Perhaps a bit hyperbolic, especially when it comes to the Lacrimosa, but not entirely false. Brandenburg #3 is sublime, so too the less often performed #5, which is a happier piece. I believe it is one thing to listen to such magnificent music as the Bach B Minor, and quite another to sing it, especially the Sanctus and Dona Nobis Pacem (my vote for the most glorious piece of music ever written). I just wish I had the ability to play either piano or cello, but my laborers hands lack dexterity. admittedly not the same as hearing a live performance. The theorbo must pack a sonic wallop . . .
years -- the opening chorus paints an awe-inspiring musical picture that must be much amplified (literally ?) in the cathedral . . . The keyboard concerto's (actually clavier) Bach interestingly derived "after" others are wonderful. Sixteen can be found on a 3-record set performed by Sophie Svirsky on Monitor Records. It's unknown whether he prepared them for his own instruction, to make them wider known or just delighted in putting his own stamp on them, which was most likely the case since other than a number of them by Vivaldi, most were by unknown or lesser composers. Thanks, Jim. I'll look for those. Bach's keyboard works sound just fine on the piano, which can bring forth lines somewhat obscured on the harpsichord. Andras Schiff has performed admirably, for instance. For me, a Landowska or a Scott Ross are worth a hundred Glenn Goulds. But to each his own ! What is the (rough) maximum distance between a perforated board in a clerestory and the opposite wall where its shadow would be cast? Obviously it differs for various houses, but can we estimate the ranges for this wall-to-wall distance and the height of the clerestory.